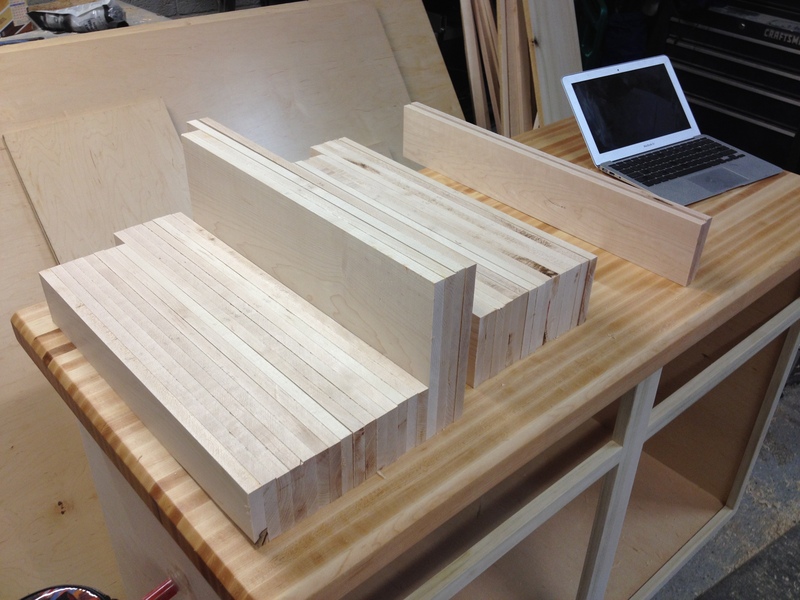 Building dovetail drawers is one of my favorite things to do in the shop. For years I thought the joints were for only the best woodworkers and would be difficult if not impossible to master. While they do take some planning and careful setup they are achievable for the average home woodworker. First thing I should mention is that the quality of your dovetail jig and your setup are the most important aspect of making dovetail drawers. I absolutely love the dovetail jig I received as a gift from a friend from Rockler. The jig is capable of all kinds of dovetail joints. 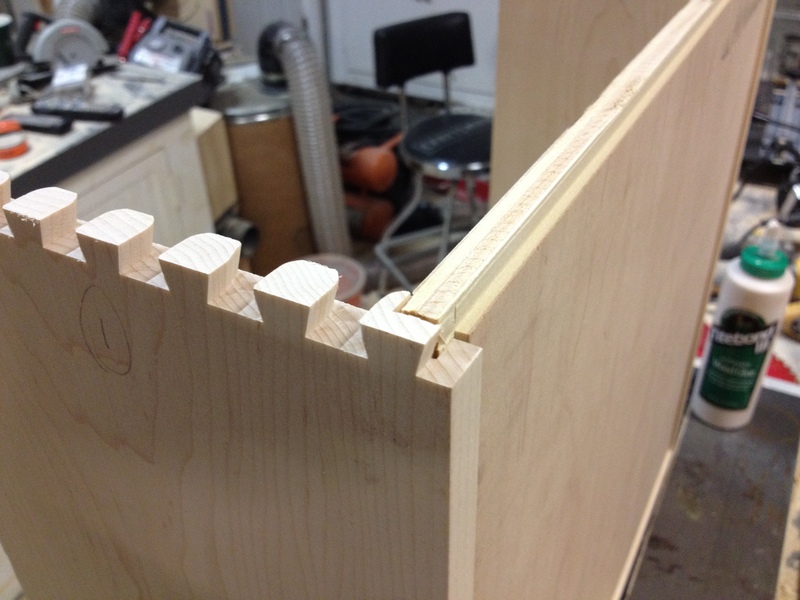 For drawers I always use half-blind dovetails. Items Needed: Dovetail Jig, Plunge Router, Router bushing and bit set, surface planner, table saw, miter saw, clamps, sanders, and finishing supplies. 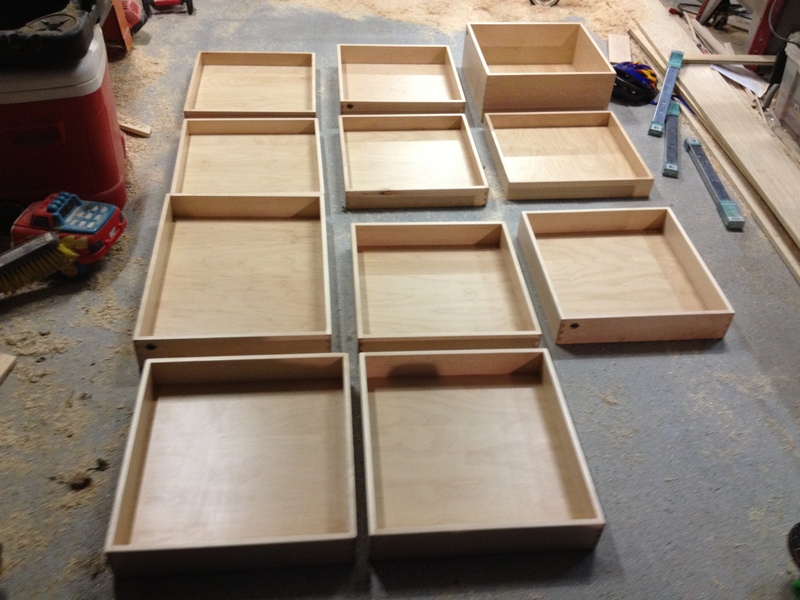 Step 1: I always make drawers boxes out of Maple. The resulting drawers are very strong and resistant to everyday ware and tare. 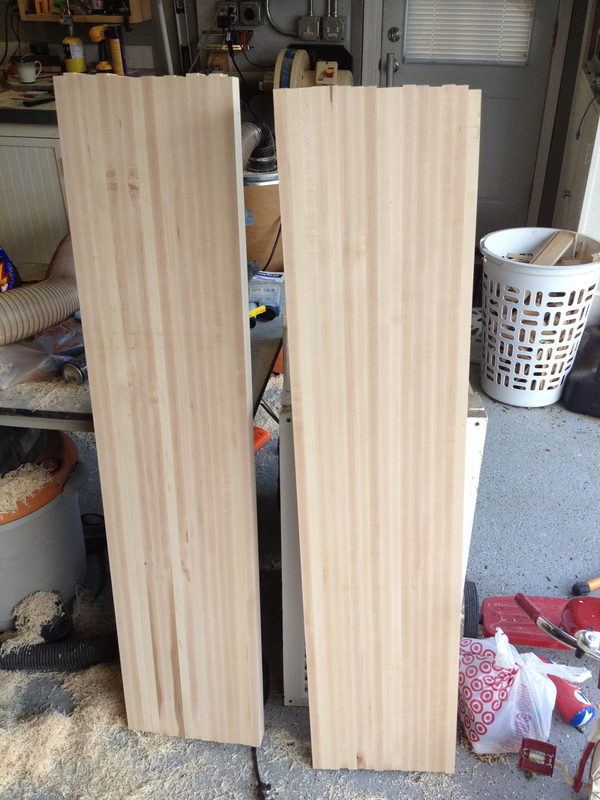 However, do to its hardness it is not very forgiving and for your first few practice attempts poplar is a great choice. One aspect that is critical is that your starting materials must be exactly sized and matched. I surface plane my material to between ½ and 5/8 of an inch and use my table saw and joiner planner to make stock materials that are in exact even inch multiples. 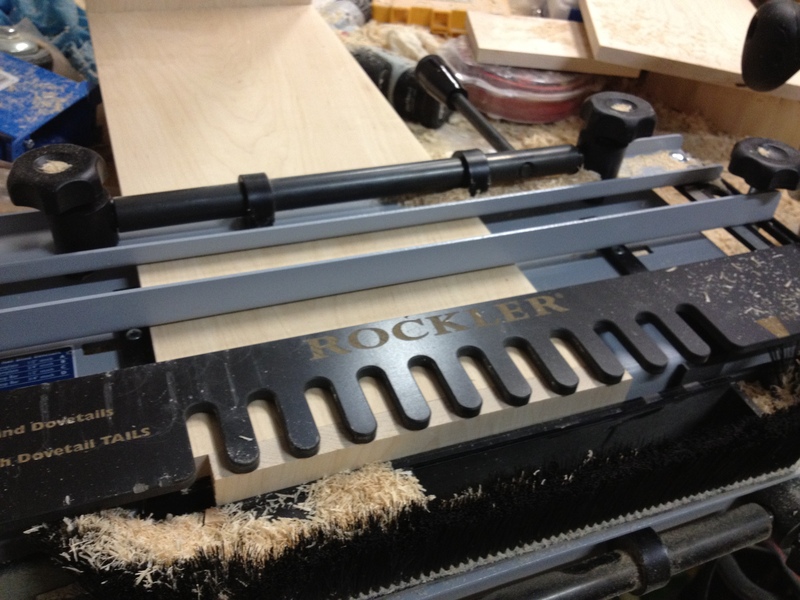 The rockler dovetail jig produces drawers that are at even inch heights. Be careful to verify the dovetail spacing on your jig prior to starting. With half blind dovetails the front and the back of the drawer are cut to the exact final width. For the example I am using side mount 100 lb ball bearing slides that require the drawer to be one inch narrower that the rough opening for the drawer. 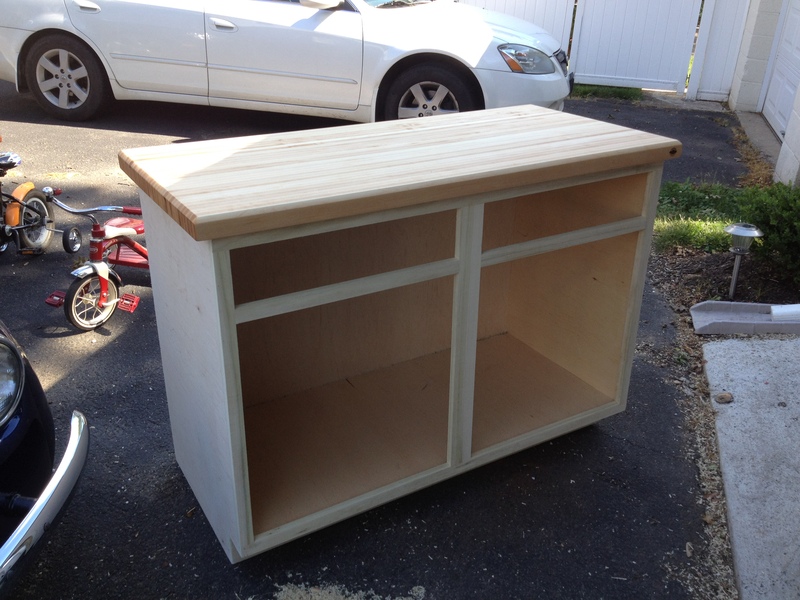 The sides are cut roughly ½ inch shorter than the desired depth of the drawer. It is very important to already have selected your drawer slides prior to construction to ensure an accurate fit. 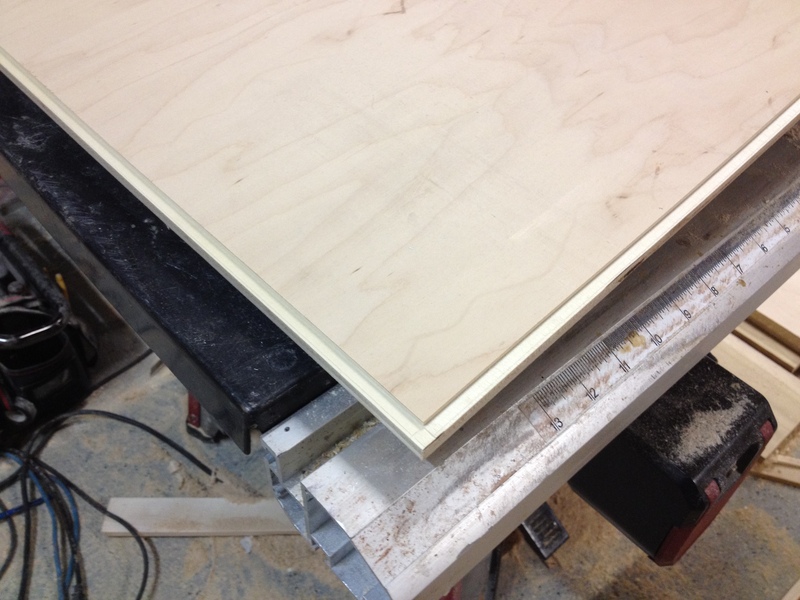 Step 2: The drawer front/back is loaded into horizontal portion of the jig and clamped. The side is positioned offset in the vertical portion of the jig by an integrated stop that ensures proper ½ inch offset alignment. It is important to note that you are viewing the eventual inside of the box. Alignment of the back bar and teeth bar are based on the thickness of your material. Small amounts of change result in large changes in the final box so make small adjustments. I highly recommend testing on scrap material prior to moving on to finished parts. After routing I label each joint as 1,2,3, or 4. The jig produces a “matched set” which results in the best fit for joints cut in the same routing step. Step 3: The router must be setup with the appropriate dovetail bit and bushing. The bushing rides along the teeth of the jig. The height of the bit determines the “tightness” of the fit. I learned after much frustration with a fixed base router to use a plunge router with a micro height adjustable stop to dial in the joint. A difference of a 64th of an inch can change a joint from too tight to too loose. When using maple you must be careful to have a joint that is not too tight since it can result in a crack in the final dovetail. Your joint should only require a gentle tap with a mallet to go together. Step 4: After careful setup the router is now run around each of the teeth in the jig to provide the dovetail profile. You will notice that on a half blind dovetail the pockets and the tails on the inside of the drawer are actually rounded. This part of the joint is completely invisible once the drawer is assembled. It is important to take your time and ensure that all the material is properly removed. 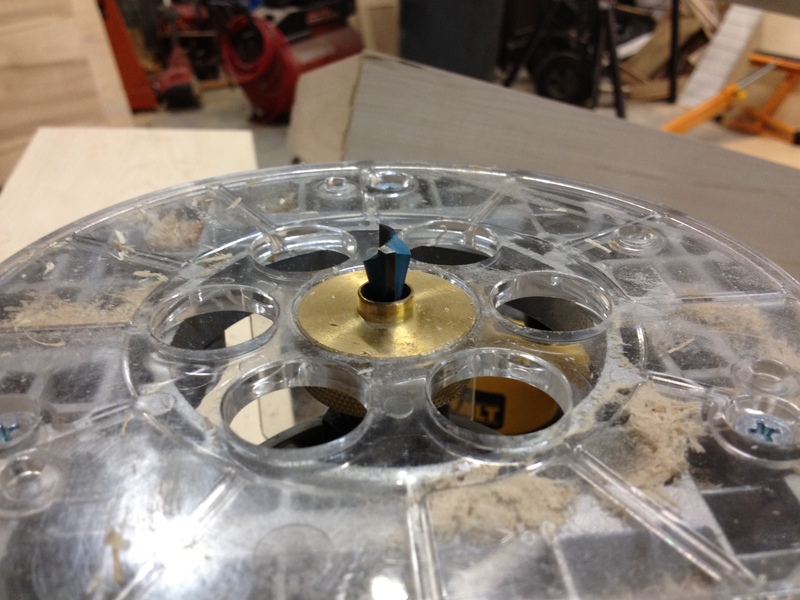 Once the jig is “dialed” in it drawers can be produced very quickly. 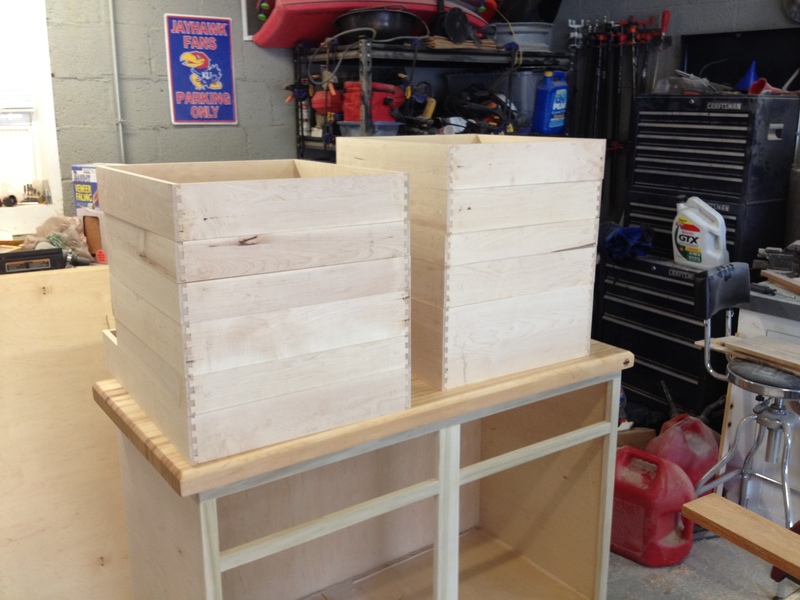 It takes virtually the same amount of time to build 10 drawers as a single drawer. Step 5: I prefer to use ½ inch plywood for the bottom of drawers. ¼ inch material can be used for smaller drawers but can when used can sound “hallow” or cause eventual sag in larger drawers. As a result, I rabbit the edge off the bottom of the ½ ply to make the thickness approx. 3/8 of an inch. 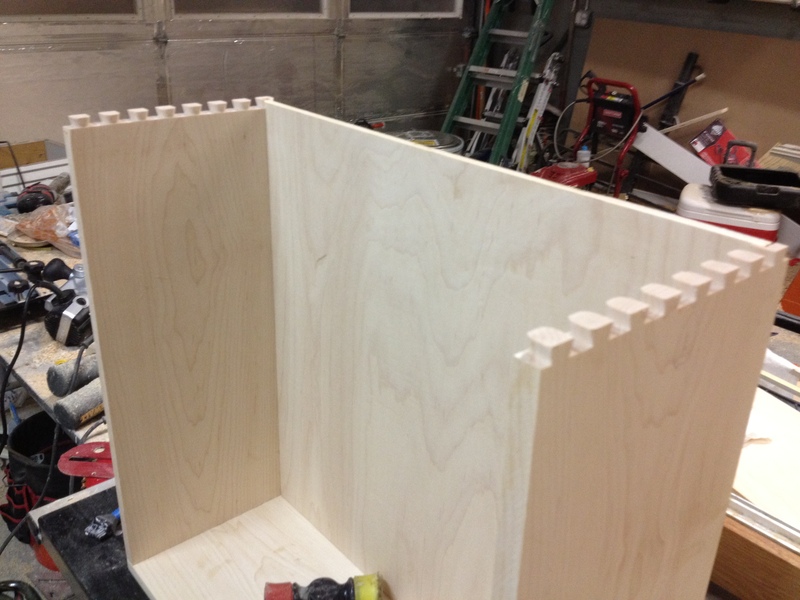 This allows it to fit in a dado in the drawer sides that is invisible once assembled. 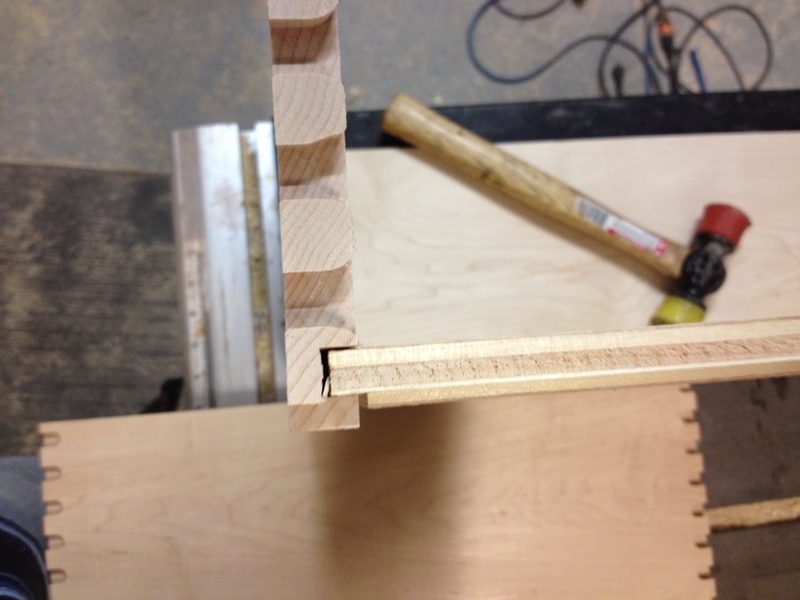 If a full ½ dado were cut in the side it would show through the final dovetail joint. The dado for the bottom must be carefully aligned as shown with the center of the tail. Step 6: The drawer should be dry fit with any fine adjustments made with a sharp chisel or sand paper. The rabbited portion of the drawer bottom should be towards the bottom of the drawer to make it invisible in the final drawer. 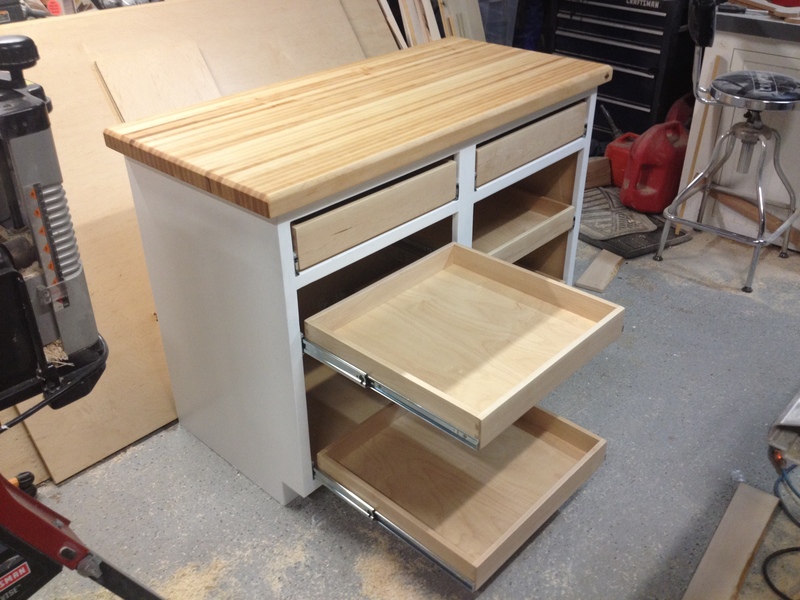 Birch plywood can be used for the bottom of the drawers since it will look similar to maple when finished. While significantly more expensive, maple plywood ensures that the sides and bottom match when complete and is a nice extra touch. 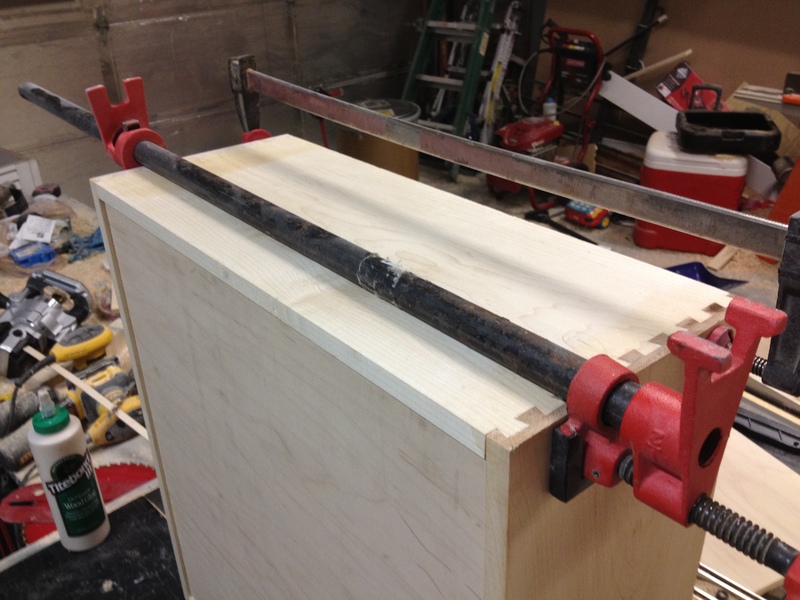 Step 7: Once a suitable fit has been achieved the drawer can be glued up and clamped. The whole surface of the dovetails should be covered in glue. However, the bottom of the drawer should never be glued into the dado. The bottom should be sized to allow for expansion and contraction by being about 1/16 of an inch smaller that the maximum size that could fit in the dado slot. While the dovetails will hold the drawer together without clamping, I always clamp the drawers as shown and ensure that the drawers a perfectly square while drying an ensuring a tight joint. 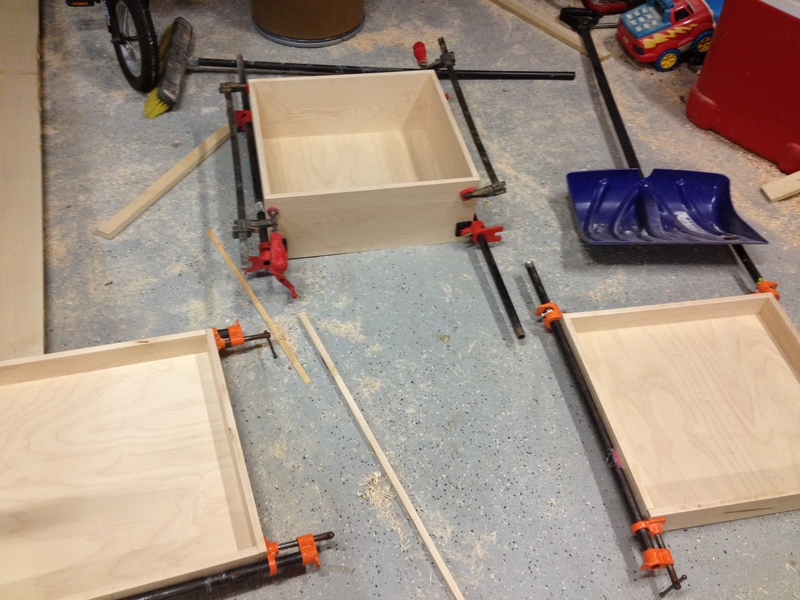 For larger drawers I use multiple clamps. Step 8: Finishing begins by sanding the drawer boxes to achieve perfectly smooth joints over the dovetails. A significant portion of time should be spent on this step. I start with 60 grit to level all surfaces followed by 120 and 200 grit sanding discs on my random orbit sander. Between 60 and 120 grit steps I use a high quality wood filler to fill any imperfections in the joints. Step 9: The finishing method I prefer is to use water based satin polyurethane to apply 2-3 coats of finish with hand 220 grit sanding in between coats. This is the step where all of the hard work will pay off resulting in a beautiful drawer. The drawers are very strong and it is virtually impossible to pull the fronts off the drawers. I also use a branding iron to put the Pennington Millworks logo on the sides of the drawers. Step 10: Installing quality ball bearing side or undermount slide hardware and drawer fronts where required is the final step to the process. If everything has been built square the process is relatively straightforward. Three-inch tall dovetail drawers make ideal roll out shelves for use in kitchen cabinets. I hope this tutorial was helpful. If you have any questions or would like Pennington Millworks to build drawers for your next project please contact me. Here is the first in a series of blog posts on the basics of constructing a few of my favorite projects. 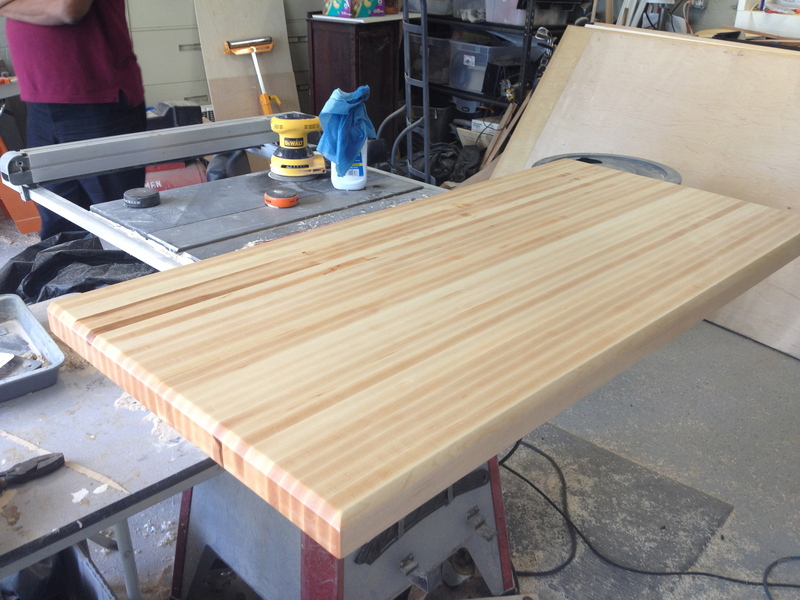 Today’s topic is an 8 step guide to building a butcher block countertop from scratch. 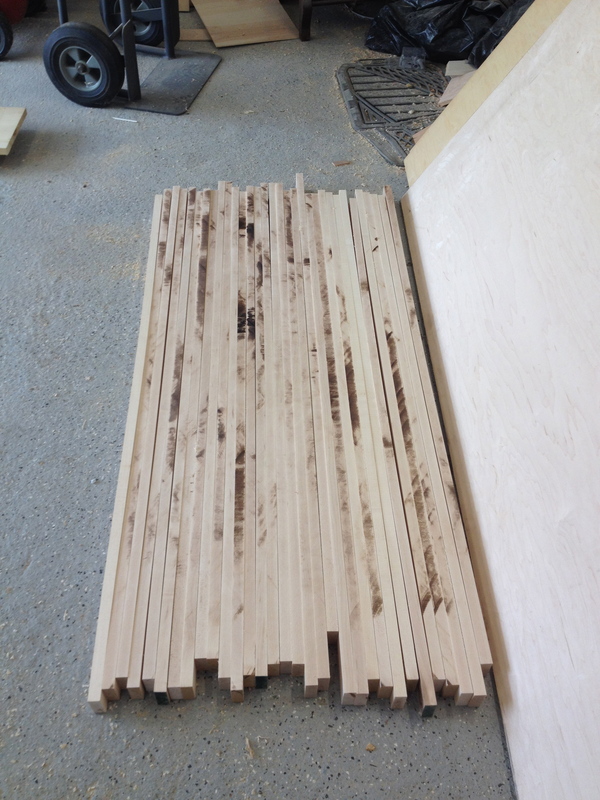 These tops are very durable since the boards are positioned with their edge grains on the cutting surface. End grain boards are even stronger but the expansion and contraction make them prone to cracking. Items Needed: There are several tools that are necessary including: miter saw, table saw, jointer planer, surface planer, sander, and a lot of clamps. In addition it requires a bottle of waterproof glue and 35 board feet of material to produce a 2ft by 4ft 1.75″ thick counter top. 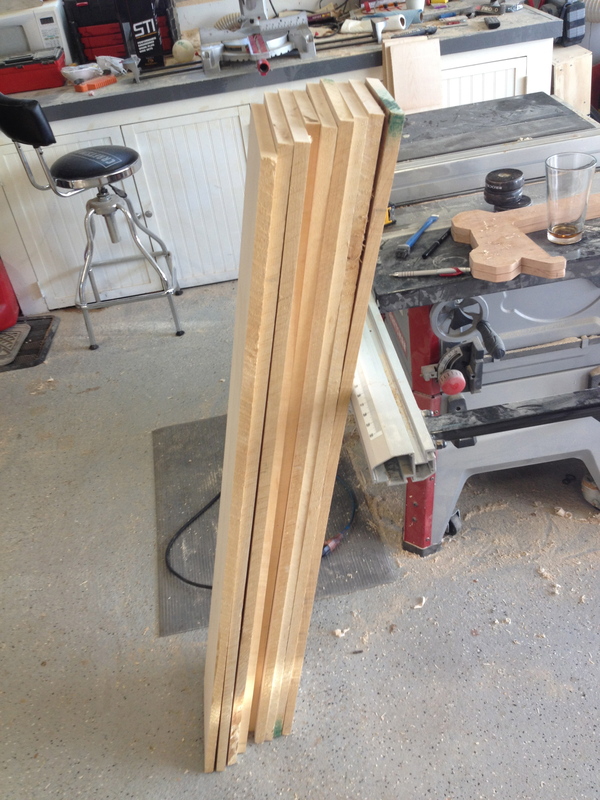 Step 1: Cut the lumber to approximately 6 inches longer than the desired countertop. By doing this each board will go all the way through the top with no middle joints. Plane the lumber to a uniform thickness (~3/4″) using a surface planer. Step 2: Run one edge through the jointer planer to make a perfect straight edge and then rip the boards on a table saw to 1/4″ wider than the countertop thickness. For the example the boards were ripped to 2″ wide resulting in a final thickness of 1.75″ (my preferred thickness for a final countertop). Step 3: Organize the boards in random order to ensure boards from the original stock are separated when possible. This makes color variations random rather then systematic. Glue up sections that will fit through the thickness planer (example: 12.5″ wide) and clamp with pipe clamps every six inches or so. This will take a lot of glue and you must work fast in order to have clamping pressure on the section prior to the glue setting up. It is important to add a extra board of each side without glue for the clamps to apply pressure on in order to not damage the top. 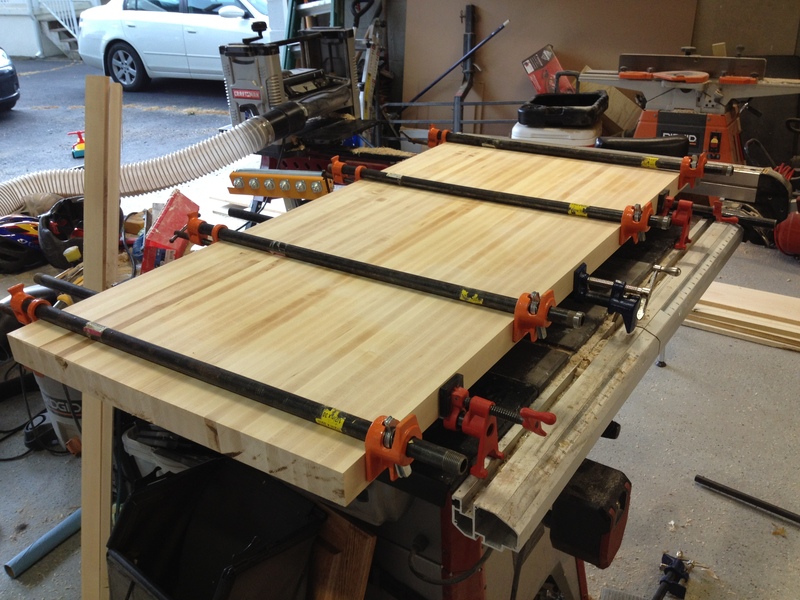 Step 4: After the sections dry remove them from the clamps and run them through the thickness planer taking off small amounts from both surfaces until they are even on both sides and at the final thickness of the countertop (1.75″). Step 5: The sections are still approximately 6 inches longer than the final dimension. 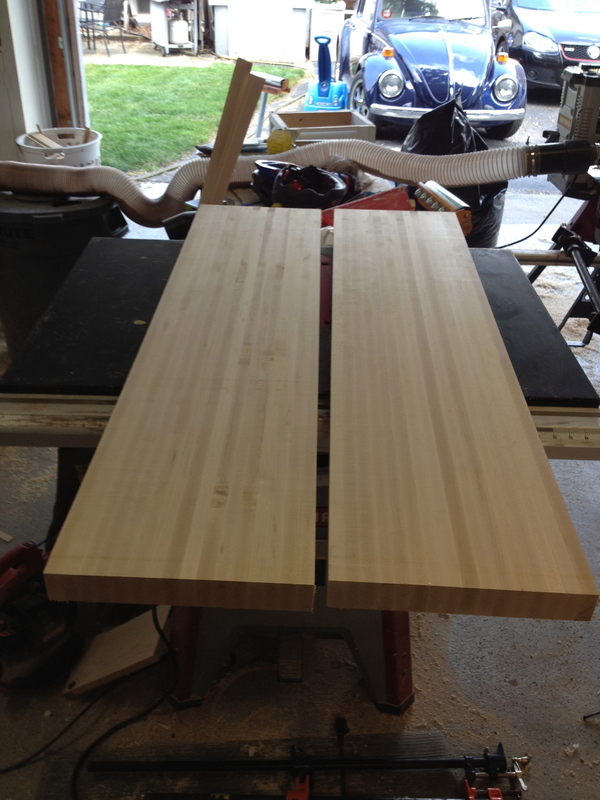 Cut material from both sides using a miter saw to arrive at the final countertop length. 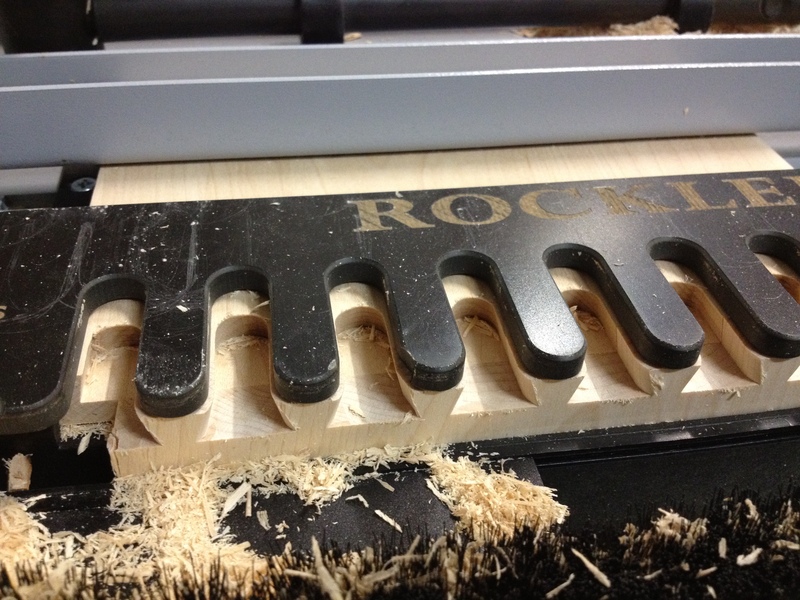 Run each edge through jointer planer to ensure a tight middle joint. Step 6: Glue the two sections together taking care to align the sections as close as possible. The closer the fit the less final sanding will be required. Clamp using pipe clamps approximately every six inches. Allow the top to dry overnight. Step 7: Remove from the clamps and sand the top flush. If your joint was aligned well in the previous step it will only require a few passes at 60 grit, 120 grit and finally 220 grit with a random orbit sander. For circumstances with un-evenness careful sanding with a belt sander may be required. 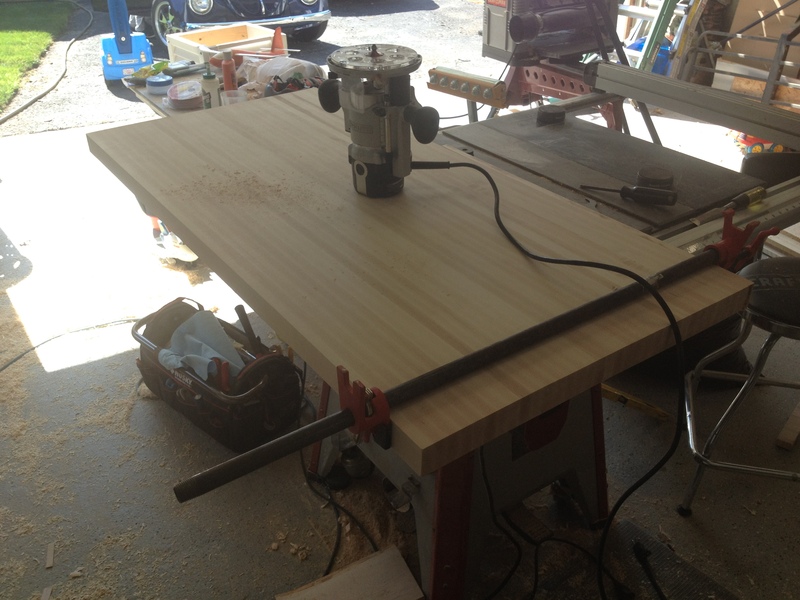 Once sanding is complete a router may be used to put a decorative edge on the countertop. For this top a 45 degree bevel edge was added. 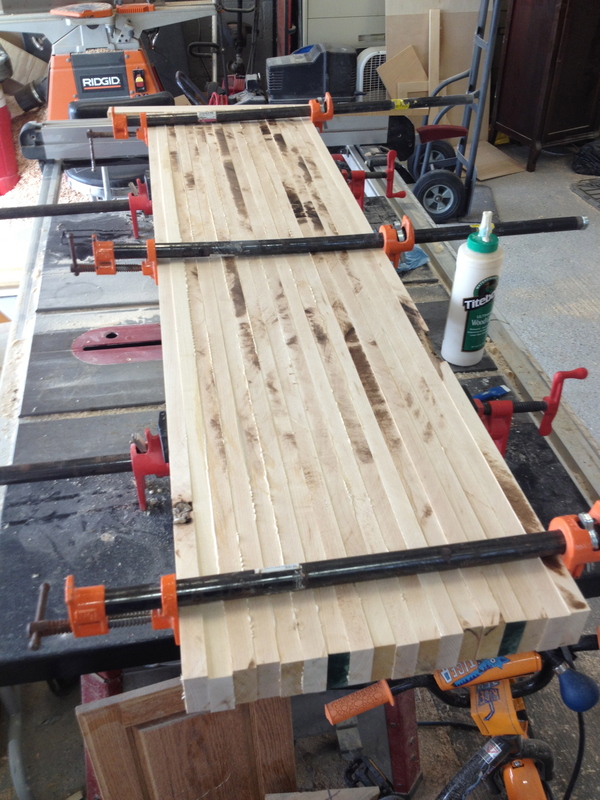 Since only three sides were to be routed a sacrificial strip was held with a clamp to ensure the rear of the board remained straight while routing the ends. Step 8 Finishing: If you are not going to use as an actual cutting board polyurethane may be used after sanding to 220 grit on the whole project. I always apply polyurethane to the bottom of the countertop to ensure it remains sealed permanently. However for the top I highly recommend applying many coats (4-6) of mineral oil followed by a mineral oil / bee’s wax combo so the surface can be used for food preparation. Installation: The block can be installed almost anywhere and should last for decades if installed properly and maintained. It is important to note that it will expand and contract significantly with the seasons. When installing I attach the tops with a single screw on each side of the countertop lengthwise and preferably in the same board. This allows the top to expand and contract without cracking. I hope you enjoyed the post and let me know if you have any questions or would like to have one built for your next project.